If you listen to the growing chorus of online chatter about the company, Google’s now-infamous “Don’t be evil” slogan is becoming increasingly inaccurate by the day. The company’s most recent move--a sweeping change that consolidated most of its privacy policies under a single umbrella--immediately drew umbrage from critics who felt that Google was on its way to taking all the data it has collected from its users through its dozens of services and building an exhaustive dossier on each of us that would be used mercilessly in efforts to sell us things. A list of URLs to all the +1s you’ve handed out. Your Google Buzz history, presuming you have one. A list of contacts from your Circles in Google+. Copies of all the Google Docs you’ve uploaded. Your full Google Voice log, including a list of all attempted and completed calls and texts, MP3s of each voice mail, and Google’s transcript of each message. Everything arrives in a single zipped file that you unpack, revealing a separate folder for each Google service. The formatting of this material can be inconsistent. Google Voice messages are saved as individual HTML and MP3 files, but your +1 bookmarks are amalgamated into a single file. Picasa photos are well organized into folders, but Google Docs are delivered en masse regardless of how you use Collections on the site. Circles and Contacts information comes in the form of several VCF files, each containing information for contacts split into each of the default categories for Google+. These are easiest to open with Windows Contacts (right-click on a file and you’ll see the option; no, I didn’t know this application existed either). Information on my Circles contacts was limited to a name and a malformed link to their Google+ profile. What’s most surprising about Takeout isn’t how exhaustive this data is, but rather how much of your Google life it completely excludes. Although Google has said that it will continue to add services to Takeout, here’s a (partial) list of what you don’t get now with the Takeout system. Anything involving Orkut, AdWords, Google Finance, and more. That list surprised me, not just because it’s so long, but also because Google does retain data for most (if not all) of those services. Your Google Search history can be accessed here, for example. Why doesn’t Takeout let you download this information instead of shipping you off to another site? If you want to get an offline copy of any of this information, your best bet is to check out the comprehensive list of how-tos at the Data Liberation Front, managed by the group of Google engineers that coded the Google Takeout service. Here you’ll find detailed instructions on how to manually get your data out of another two dozen Google-operated services not covered by Takeout. It’s important to remember that with Google Takeout you are getting a copy of the information stored on Google’s servers, and are not removing the originals from Google’s clutches. There’s no way to delete anything at all via Google Takeout. Those concerned with Google’s ability to keep tabs on you may want to pay special attention to a few of those clauses: Notably that Google can reject requests to delete information that “require disproportionate technical effort” and, more importantly, that backup copies of your data are not likely to be deleted promptly, if ever. To date, user commentary has been surprisingly muted about Takeout. Those who have written about it mainly seem thrilled to have one-click access to their Google Voice records, their Google Docs, and their online contacts. In these respects, Takeout is actually a useful tool: Downloading this information piecemeal is a pain, and Google Takeout makes it considerably easier. Painless, even. But even at a year old, Takeout is still a long way from offering users a legitimate way to get a handle on how exhaustive the information Google has about them really is. The number of services included in Takeout is paltry compared to the vast number of offerings that Google has available, particularly given that those services typically make this information available directly to the user. If Google can figure out a way to consolidate its myriad privacy policies, surely it can figure out a way to consolidate the downloading of collected user information, too. As engineering challenges go, this doesn’t seem like a toughie. 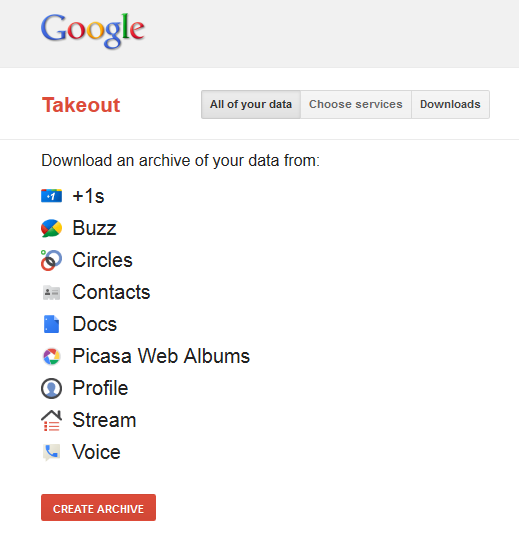 Ultimately, Takeout is a good first step toward giving users more transparency about what the company does with their data, but if Google wants to prove it is serious about privacy, Takeout needs to be radically expanded--and to imbue users with the ability to delete materials they don’t want Google to be sitting on.